What’s the Probability That Quadratic Will Factor? A comment from my post last week about the need for factoring led me to re-visit a question I have posed to classes before, but never allowed to move beyond the “gee, that’s interesting” stage. Given a polynomial in standard form, with random non-zero* integer parameters a, b and c, what is the probability that the polynomial will factor? I’ve pursued this question with classes before by writing a polynomial on the board, with blanks or boxes in the a-b-c positions. Sometimes, I would take “random” shout-outs from the class to fill in the boxes. With another class, the randint function on a TI calculator was used to generate our abc’s. The point was to demonstrate that a large majority of quadratics are not factorable, and that despite the nice, rigged, problems we encounter in textbooks, we should spend far more time considering what to do with the messy ones. But I’d never put pencil to paper and thought about the theoretical probability. 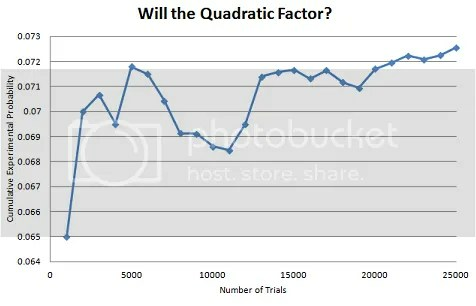 After my post on factoring last week, Jim Doherty mentioned a speaker he had encountered find an experimental probability that a quadratic would factor, and cited 7%. That number seemed reasonable to me, but perhaps a bit on the high side. I set up an Excel document to generate three non-zero integers (more on this later), and rigged a system to check for perfect-square discriminants. I recorded experimental results, in groups of 1000 trials, and kept a running total. 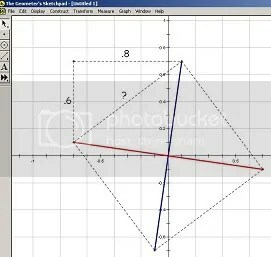 After 25,000 trials, I found that 7.26% of the quadratics would factor. *While this endeavor started off innocently and quickly enough, I had to start over after I realized my Excel document allowed for zeroes. It took a little logical Excel rigging to exclude them. So, there must be a theoretical probability out there someplace? Anyone know how to do it? In my last post, we looked at an AMC-12 problem of moderate difficulty, but with an premise that could be understood by many. This time, we’ll take a look at a problem which delves into more abstract concepts, and explore how technology can allow students to consider solutions. The following problem was question #23 from this year’s AMC-12. 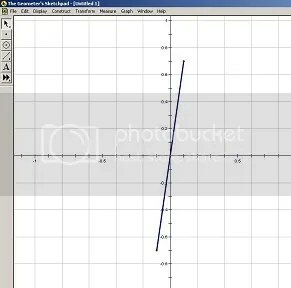 Let S be the square one of whose diagonals has endpoints (0.1, 0.7) and (-0.1, -0.7). A point v = (x,y) is chosen uniformly at random over all real numbers x and y such that x is between 0 and 2012, inclusive, and y is between 0 and 2012, inclusive. Let T(v) be a translated copy of S centered at v. What is the probability that the square region determined by T(v) contains exactly two points with integer coordinates in its interior? In this year’s contest, where over 72,000 students participated, this question was answered correctly by only 4.5% of students, and was left blank by 81.6%. Tomorrow morning, write this question in its entirety on a side board, and observe student reactions. How many students begin to sketch the square described in the first sentence? How many ask questions about some of the sophisticated language? How many shrug and turn away? This problem presents a number of chance for students to summarize given information, summarize “scary” language, and consider possibilities. How convenient for us! We have a unit square, where all sides have length 1. Even if we don’t consider the rest or the problem, think about how rich of a discussion we have already had! Pick any random point in the first quadrant, but don’t go above 2012 for x or y. We’ll call it point v.
Take the square we just made, and copy it, so that v is the center. 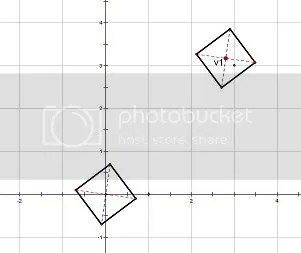 How likely is it that the new square contains two points with “integer coordinates”? This is great time to introduce the term “lattice point”. Here’s an example of what we are looking at. The original square remains at the origin, but a new one, with center v1, has also been introduced. Notice that this new square captures only one lattice point. Encourage your students to break down problems into smaller, digestible pieces, and not be afraid or scary-looking language. The rich class discussions which come from allowing time for questions to stew and worth it! One of the many tasks I perform for my school district is serving as math club sponsor. While I often attempt to find interesting activities and experiences for the club, many students join math club to participate in the contests we tackle each year, and this month tends to be a particularly busy period for contests. In-house contests include the Pennsylvania Math League and the American Mathematics Competition exam series. Today, I am writing my blog post from a lecture hall at Lehigh University, while two floors below hundreds of students are participating in an annual contest organized by Dr. Don Davis, who uses the event to recruit students for his American Regions Math League teams. Tomorrow, two teams of students I work with will attempt the Moody’s Math Challenge, where students are given 14 hours to complete and open-ended question and submit a solution. I recall a conversation I had with a math department head I worked with when I first became a teacher, and the conversation centered around why our school didn’t have a math club. The veteran teacher responded that he didn’t believe in doing math problems as competition, and I suppose that I agree with the essence of his argument: that sitting alone, isolated, doing a series of problems may not be the most enriching of pursuits. But the conversations that take place surrounding challenging problems can lead in interesting directions which often encourage collaborative thinking and build confidence in approaching “scary-looking” problems. The problems from the AMC 10 and 12 exams, in particular, lend themselves to discussions of problem-solving approaches. Each exam is set up with 25 multiple-choice questions which loosely go in sequence from least to most challenging. Many students I coach can handle the first 10 to 12 questions, and may venture as high as question 20, before sensing that the questions have taken a turn towards the evil…questions with wording and symbols beyond their experiences. A 3×3 square is partitioned into 9 unit squares. Each unit square is painted either white or black with each color being equally likely, chosen independently and at random. The square is then rotated 90 degrees clockwise about its center, and every white square in a position formerly occupied by a black square is painted black. The colors of all other squares are left unchanged. What is the probability that the grid is now entirely black? It’s a probability question. 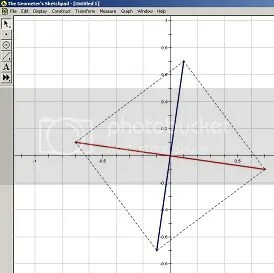 I know that these types of problems often appeal to me, as opposed to geometry questions, which often interest me less. It has an accessible premise. While we may have trouble down the road computing the probability, this problem can be easily de-constructed, simulated and discussed, even by middle-school students. Then, follow the directions to make an altered grid: every white square in a position formerly occupied by a black square becomes black. All other squares are left unchanged. 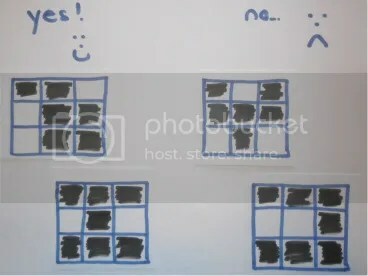 In the example below, our grid fails, since the results is not all black. 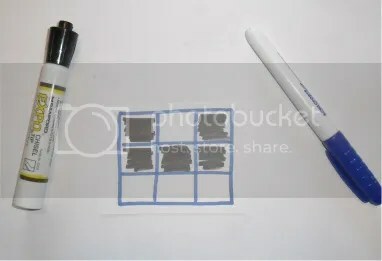 With younger students, hand out some pre-made grids, where some will become all black after the transformation. Can students categorize those which become all black? 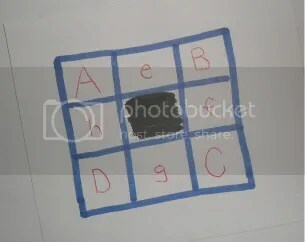 For more sophisticated students, hand out more 3×3 grids and experiment to see if they can develop one or more grids which satisfy the problem. Can we list arrangements for ABCD which will result in all black? Certainly black-black-black-black works, but so does white-black-white-black. Are there others? This then shifts the nature of the problem from a scary-looking probability question to a more tame (but still semi-scary) counting problem. I’ll leave the counting to you and your students. In my next post, we’ll look at a geometry example from this year’s AMC-12. It’s Super Bowl weekend, otherwise known here as the weekend I lose 5 bucks to my friend Mattbo. Matt and I have a standing wager every year on the Super Bowl coin flip, and I seem to have an uncanny, almost scary, ability to lose money on the flip. I also lose money to Matt on Thanksgiving annually when my public school alma mater is routinely thrashed by Matt’s catholic school, but that’s a story for another time. Coin flipping seems vanilla enough. It’s 50-50 probabilities make it seemingly uninteresting to study. But beneath the surface are lots of puzzling nuggets worth sharing with your students. The odds a team that wins the coin toss will win the Super Bowl are 1 in 2.15(47%). The odds a team that loses the coin toss will win the Super Bowl are 1 in 1.87 (53%). 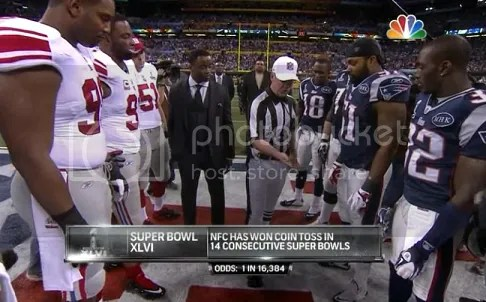 The odds a team that calls the coin toss will win the Super Bowl are 1 in 1.79 (56%). UPDATE: In 2007, NPR ran a short piece during “All Things Considered” about the coin-flipping run, which was then in year 10. Finally found it here. It’s a quick 4-minutes and great to share with classes. Exploring runs in coin tossing through simulation allows us to make sense of unusual phenomena. On the TI-84, the randint feature allows for quick simulations (for example, the command RandInt (1,2,100) will produce a “random” string of 100 1’s and 2’s). Deborah Nolan, a professor and author from UC Berkley, has developed an activity which challenges students to act randomly. 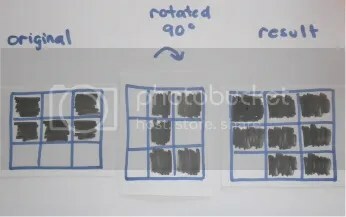 A class is split in half and given a blackboard for recording coin flipping results, and the professor leaves the room. One group is charged with flipping a coin 100 times, and recording their results accurately. The second group is given the task of fabricating a list of 100 coin flip results. After both are finished, the professor returns and is able to quickly identify the falsifies list. Too few runs give the fabricators away. Does the manner in which a coin is tossed make the outcome more or less predictable? Engineers at Harvard built a mechanical flipper to examine the relationship between a coin’s initial and final positions. The assertion that much of the randomness in coin flipping is the result of “sloppy humans” is tasty; we humans have trouble being random when needed. 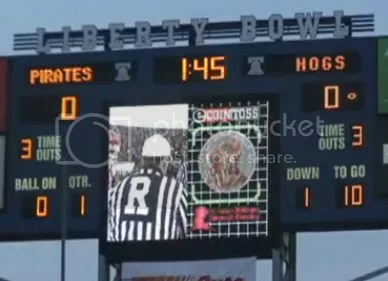 Along the same lines of innovations in coin tossing, the 2009 and 2010 Liberty Bowl football games used something called the eCoin Toss to make the toss more accessible to the crowd.